Moving house this week is not something I’m looking forward to especially moving all my fabric stash! 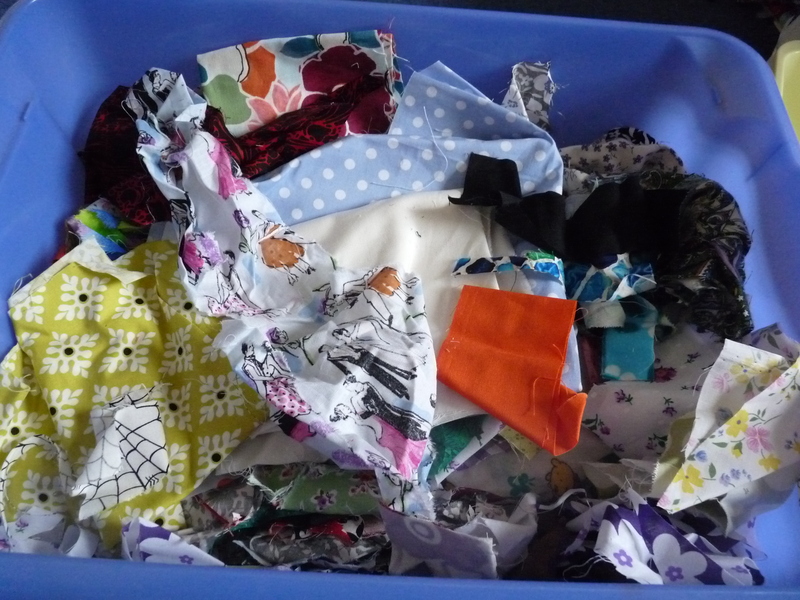 Saturday I decided sorting out my scraps would ease me painlessly into it however… there is a lot! One box and several bags worth. It seems that whatever I cut I swept into a bag so there’s these…. 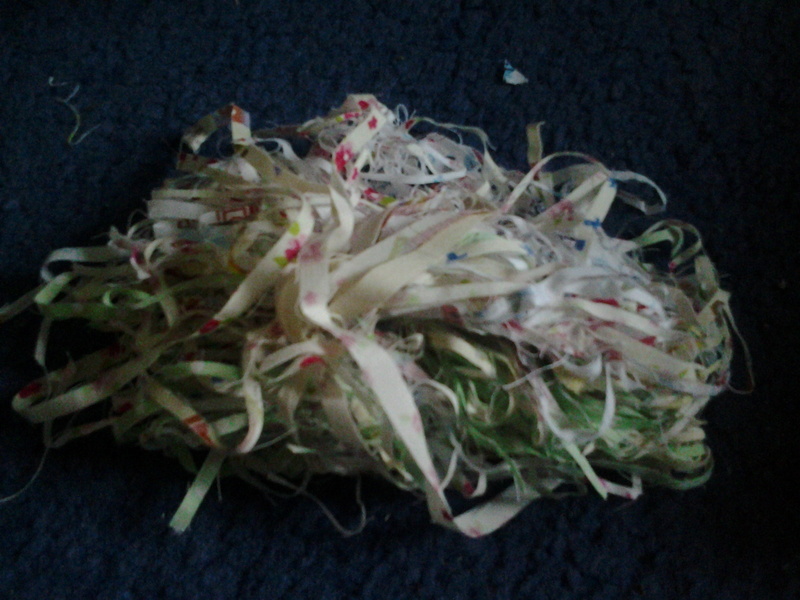 Really what is the point of all the shredded paper like bits?! Especially when I’m keeping leftover wadding. I managed to condense it all into one big box and now I want to play with it…. So do you have a scrap habit and what do you do with it all? I will cut an inch corner off a piece of appliqué AND KEEP It!!! My scraps box is overflowing of little bits and pieces!!! Lol but now that I’m doing more appliqué , the tiny quarter inch corner serves as a flower center, or a leave or a butterfly wing!! So that’s how I’m using up my scraps, I hope to tackle a scraps quilt soon! Thanks for a fun post! ha I have been wondering the same thing – what to do with my scraps. Though I mainly have bigger pieces that I figure I can make “something” with… one day!! I am planning on making wee toys for kids from some of my stash though! 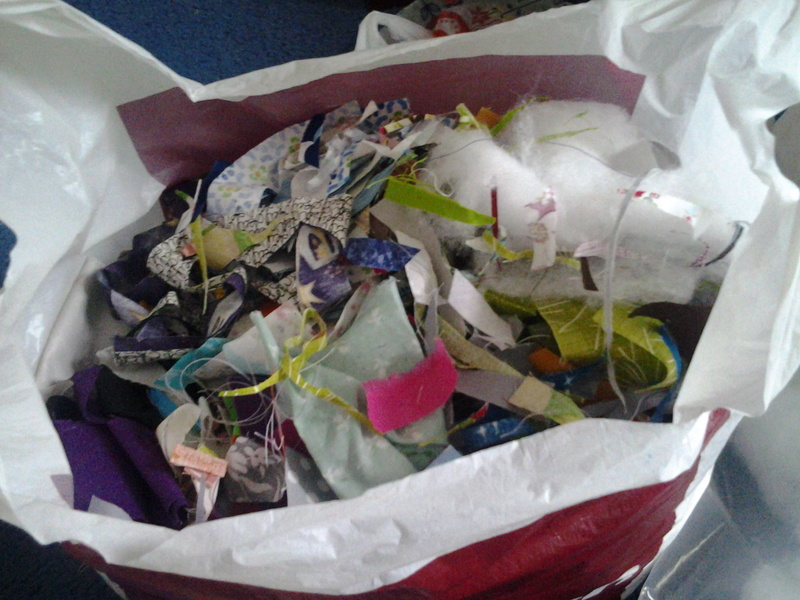 I only keep decent scraps but with the shreddy bits I will keep from now on and keep for charity to sell to the rag man. Also the tiny bits of solids and batiks (i.e. double sided fabrics), you can shred them up and trap them under tulle to make confetti quilts. I sort mine by size, bigish ones (larger than a fat 8th) I keep to use in future projects. Medium ones I keep for applique and quite small (eg, just a few cms) I use for testing stitches when I have just re-threaded the machine, changed the bobbin or am changing stitch. Selvedges and really small strips I bin. Otherwise I know I’d just hoard them but never use them for anything. You just never know when scraps might come in handy. Hope the move goes well! I can’t bear to jettison any scraps – even the shredded ones! I use the tiniest pieces on my embellishing machine, or stitch them between two layers of water-soluble stabiliser.